Ask fellow campers about "Woodsong Campground" and nearby attractions. The nightly sites are easy to get to and are all back-in. Interior road is gravel and sufficiently wide for maneuverability. The park is clean and tidy. Check-in was quick and easy, access to the park is through a key-pad gate so the area is secure. We camped at Woodsong Campground in a Travel Trailer. Checked in and was amazed at how beautiful this campground is. The owners are friendly and willing to please. We stayed the weekend that they were welcoming back the seasonal campers to the campground. We went to our site and it was real big. We had electric and water but no sewer. The area where we set up our camper was all grass and very nicely cared for. The campground has a lot of trees but they were not a problem to back the camper into the site. Quiet time is 11 pm and it was quiet before this time. That was great. The bathrooms were clean and there is a laundry on site if you need it. They have a pool that is big, clean and very nice. They also have a big chess and checker set, horseshoes, basketball and a playground for the kids. We camped at Woodsong Campground in a Travel Trailer. More, MN is only a 15 minute drive from this campground. We forgot some items and were able to run to town to pick them up. 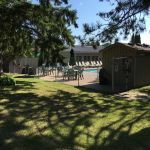 Beautiful shady open campground with friendly hosts, excellent food, nice lodge with hot tub and swimming pool, and Ann Lake just a 2 minute walk away. We camped at Woodsong Campground in a Travel Trailer. Very nice laidback capmground. Mostly for seasonals. Nice grassy sites that saved us because it rained quite a bit. Small playground that the kids lost interest in fast. Very nice owners and would recommend this place for a quick get away for a relaxing weekend. We will go back. We camped at Woodsong Campground in a Motorhome. Campground has changed owners and is now Woodsong Campground. This is primarily a seasonal campground, but they do have a few nightly sites. The owners were incredibly nice. There is a pool, playground and rec hall with games such as ping pong for the kids. Beautiful lodge that serves food (snacks and such). We camped at Woodsong Campground in a Travel Trailer. Are you affiliated with Woodsong Campground ?